A place with a beautiful view where old charm meets nature. 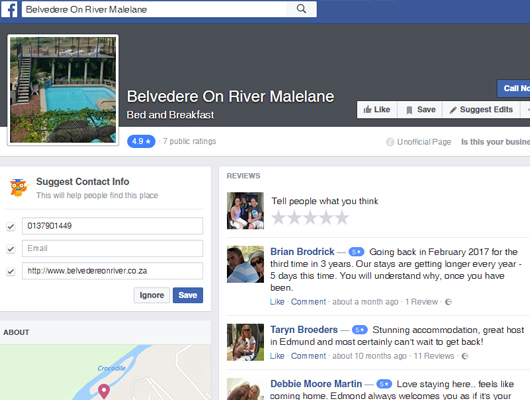 Belvedere on River is situated on the Southern Bank of the meandering Crocodile River with stunning views overlooking the Kruger National Park with regular sightings of the big five. Malelane is situated on the N4 in the middle of the Wild Frontier within the Maputo corridor and close to the casino's of Swaziland .With only four hours drive from Gauteng to Malelane in Mpumalanga, the Mozambique and Swaziland borders are only 35 - 60 kms away. The Panorama Route which includes towns like Graskop, Sabie, Hazyview and Pilgrims Rest is within easy driving distance.